Time 9:00 A.M. ~ 4:40 P.M. Please bring your ID for the RCBC Plaza ground floor security desk. 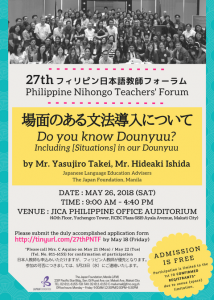 Please submit the online application form (http://tinyurl.com/27thPNTF) by May 18, 2017 (Friday). * After submitting your online application form, please call Mrs. C Aquino on May 21 (Mon) / May 22 (Tue) (Tel. No. 811-6155) for confirmation of participation.